You can get to know our Stallholders better by following our Instagram and Facebook pages, each week we try to do a feature on one of our Stall Holder from each venue. You’ll get to know more about what the featured stallholder offers and a little about themselves. Below are a hand full of the lovely stallholders we’ve already featured. Linda from Stall 565 Geelong and 340 Daylesford. @lilypilydesigns is a bespoke home wares business owned and operated by local Geelong woman Linda Ridgway. The Lily Pily range which includes customized cushions, bags, quilts, aprons, doorstops… is proudly designed and made in Geelong using classic and contemporary fabrics from around the world and Linda’s own Melbourne printed linens. 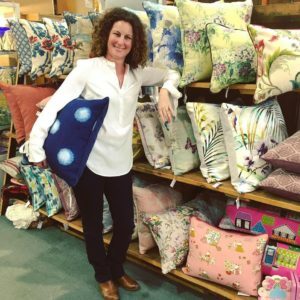 While the heart of the business is firmly placed in Geelong, Lily Pily Designs has created cushions for clients in Europe and Asia and has appeared in magazines such as British Vogue and The World of Interiors. 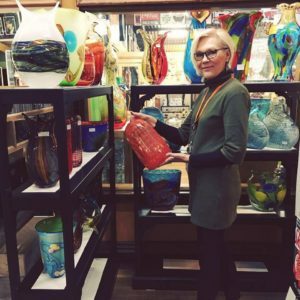 Linda is proud to create a range of products with a point of difference in her home town, unwavering from the philosophy that local production, individual service and authenticity are the keys to success. 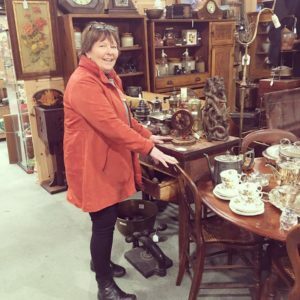 The Geelong Mill Market was the starting point for Lily Pily Designs and while it was supposed to be short term, five years later Linda is still there happily selling her wares alongside the great team of stallholders. Linda also shares stall 340 in Daylesford with another long term Mill Marketer Ingrid Ellis. Specialising in unique keepsake gifts. Including handmade International Art Glass, Artist designed Babushkas handmade in Russia and Sterling Silver Jewellery with semi precious stones. Along with a range of Michelle Allen Bags, Ceramic Pottery and Clocks (currently on sale). AndekriS started as business over 15 years ago and has become a hobby that’s grown and grown. After closing their gallery to take a rest they set up a stall at the Mill Market which now feels like a second home. Deb from Temple Antiques at Stall 421 Daylesford. Stall 421 offers a large range of Antiques and Collectables. From rustic wares, furniture and clothing to silverware. Along with an assortment of Glass and China. Deb has been known to be a collector of a whole range of different things at different times.